Kirby's Max HP is raised by 60. 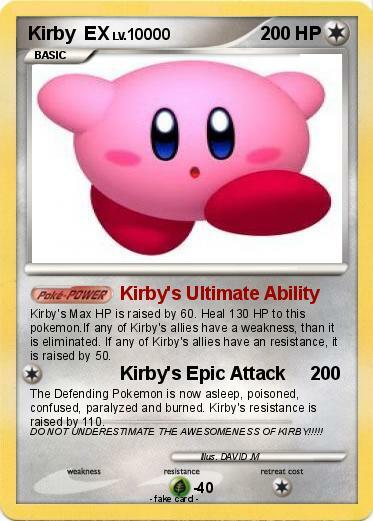 Heal 130 HP to this pokemon.If any of Kirby's allies have a weakness, than it is eliminated. If any of Kirby's allies have an resistance, it is raised by 50. The Defending Pokemon is now asleep, poisoned, confused, paralyzed and burned. Kirby's resistance is raised by 110. Comments : DO NOT UNDERESTIMATE THE AWESOMENESS OF KIRBY!!!! !